A lighthouse makes a great addition to your Minecraft world. You can even add a rotating beam circuit at the top. 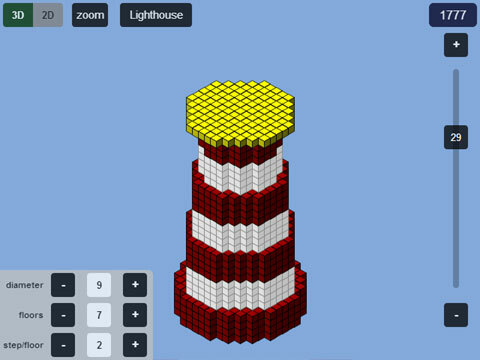 This page will guide you on how to use Plotz HTML5 modeller for Minecraft to model a lighthouse. Launch the Lighthouse Generator from the link below. 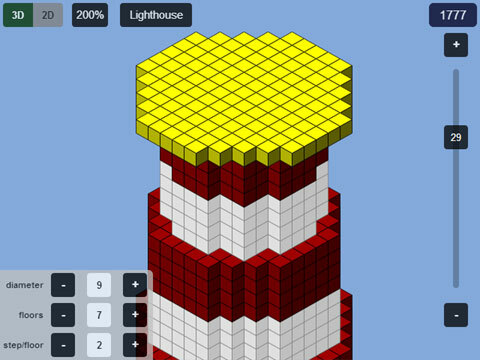 Launch Plotz Lighthouse Generator from the link above or select the model from the Plotz model menu. A default lighthouse model will be shown. Resize your browser window or enter full screen mode if required as Plotz uses the full extent of your browser. Lighthouses being tall suit portrait mode very well on mobile devices that support orientation changes such as the iPad. 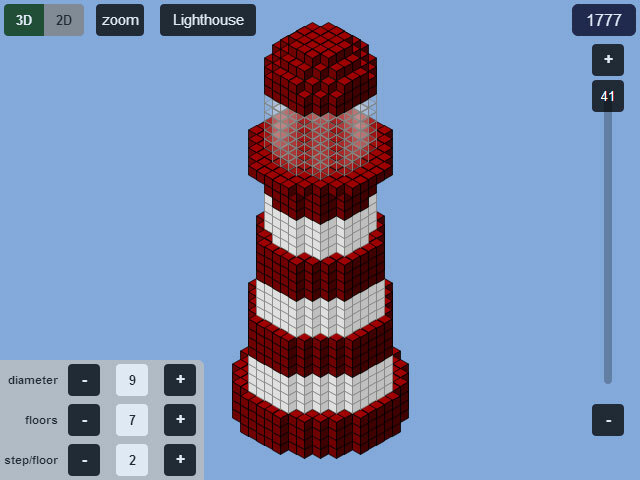 There are currently no sliders to alter the dimensions of the lighthouse (unlike most other Plotz models). Instead, change the dimensions from the panel in the bottom left using the + and - buttons. Diameter is the size of the bottom floor. Changing this affects the height of the lighthouse. The height is also dependant on the number of floors. Step/floor affects the incline of the tower with higher steps producing a straighter tower. In the top right you will see the how many blocks you'll need to build the model in Minecraft. Use back in your browser OR select the model name button at the top to return to the model menu. The right hand slider allows you to show a specific horizontal layer of the model. In 3D mode this layer is highlighted yellow so you can clearly see the blocks on that layer. Start building in Minecraft from layer 1 at the bottom and work up using the + button to advance to the next layer. You can remove the top layer highlight by selecting the + button again. The zoom button in the top left cycles through 200%, 400% and back to 100%. Zoom works in both 2D and 3D modes. While zoomed, drag the canvas to pan around. The display is updated when you stop dragging to best utilize graphics memory. Toggle between 2D and 3D mode using the buttons in the top left of the display. 2D mode displays a plan grid of the current layer of your model. Blocks you should build on the layer are clearly shown while unobscured and visible blocks on the layer below appear ghosted out to help position the current layer. Block counts in coloured groups of 5 (5 red, 5 green, 5 blue etc.) aid building curves. 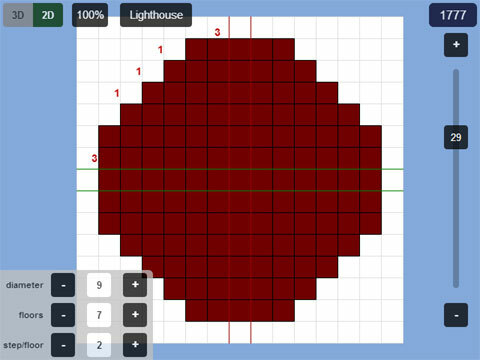 They are shown in the top left quadrant only as symmetry means you can build your lighthouse by repeating this quadrant to be built 4 times over.